Support the first revision in 20 years of nine major national laws and regulations that combat habitat destruction and strengthen community monitoring of illegal forest activities. 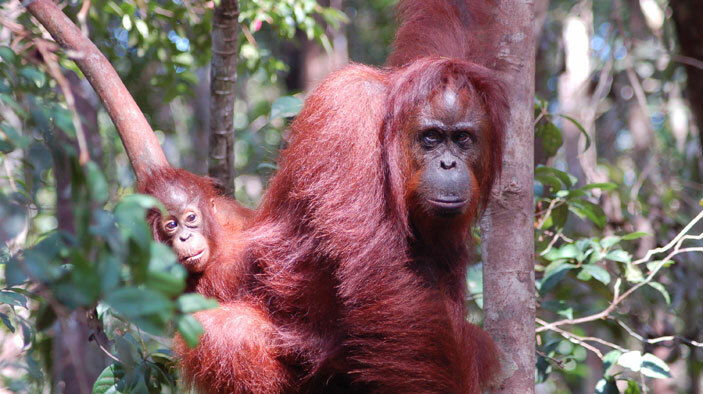 Generate private sector support for orangutan conservation. Conduct aggressive communications raising awareness of the importance of forest conservation for biodiversity preservation and climate change issues. Active in 3.5 million hectares, covering 40 percent of Indonesia’s orangutan habitat, the project improved management of 1.3 million hectares critical for orangutans and many globally important species. Convened key actors across various sectors to provide input into the Ministry of Forestry’s National Orangutan Strategy and Action Plan 2007–2017, which was announced by the Indonesian President at the United Nations Climate Change Conference in Bali in 2007, and commits the Indonesian government to stabilizing all orangutan populations by 2017. A key victory in East Kalimantan saw the indigenous Dayak people of Wehea awarded Indonesia’s highest environmental honor for protecting and managing 38,000 hectares of rainforest from lowland to mountain. The area—an important water and medicinal plant source for the Wehea people and home to 500 to 750 orangutans—was declared protected by the local government, which helped fund its management while private firms helped fund infrastructure.